For the love of sweet baby Jesus, don’t change the routine. It’s a lot like the movie “Groundhog Day” at our house, except the routine doesn’t always work…yet we cling to it like a lifeboat in the middle of a storm. Those with autism have a huge problem deciphering what will come next – having a set routine helps them create stability, and allows them to feel safe. I can count the number of foods our daughter will eat on one hand. When she DOES try a new food, even if it’s super unhealthy (like a donut, or cookie) – we’re thrilled! She is not just a “picky eater”, she is a “problem feeder,” meaning she has an extremely restricted number of foods she will actually eat on a regular basis, she cries and falls apart when presented with a new food, and will refuse entire categories of food based on texture. We didn’t sleep through the night for over two years. She was up at least 2-3 hours overnight, every night. The lack of sleep was crippling, and I have no idea how we continued to function. Some children with ASD use melatonin since they’re bodies don’t produce it but that didn’t work for our daughter. We did eventually find something that worked best for her. Everyday outings can be overwhelming for those with autism– the lights, sounds, the typical hustle-and-bustle you or I would consider “normal” can just be way too much for them to handle, so they either shut-down or meltdown. Sensory processing issues can be crippling at times, and all of it definitely plays a big part in where we can (and can’t) take Lila successfully. She has to work incredibly hard just to be “OK” in our world, every single day. Play dates are the most difficult thing to watch (for me, anyway). Our daughter and our life are completely normal to us until I’m faced with “typical” children her age. Seeing children genuinely try to interact with Lila; call her name, go up to her and speak, follow her around, and attempt to play with whatever she’s playing with– and watching her get upset and run away– it’s brutal. ALL parents are nervous when their child gets medical tests, procedures, surgeries, etc ( and we’ve been through plenty of them). However, once you have seen your child have a regression due to something no one was able to warn you about (ie nitrous), it takes that paranoia to a whole new level. I second-guess everything, and do more research than you can possibly imagine on a myriad of topics you’ll never have any need to know about (ie MTHFR gene mutations). She has fought so hard to get where she is, the thought of us making a decision that could cause us to “lose” her again is beyond terrifying. We used to have more friends (and family for that matter). The truly good people stick around, but there are those who don’t. It’s a lot to deal with– totally understandable. If you’re not willing to put in the work to actually interact with Lila on her terms, or if you look at her and treat her as “less than,” then she doesn’t need you in her life and neither do we. All of us have these preconceived ideas about the holidays and what they “should” look like. There are a lot of things about the holidays those with ASD find difficult to deal with (change of routine, crowds, the noise, new and different smells, traveling, etc). We have had to ditch a lot of the old ways of doing things and find ways to celebrate the holidays that are new and different. We create our own “normal” and just do what works best for our family. We don’t have a child who runs to us yelling “Mommy! Daddy!” and hugging us. That’s just not how it works with Lila. We’re so incredibly grateful for where we are now– a year and a half ago (to her) we didn’t exist. She wouldn’t acknowledge us hardly at all. Nowadays she follows us around wanting to interact with us. It’s incredible! She is still currently considered “non-verbal,” but trust me, she loves us just as much as any other child loves their parents (I can FEEL it!). She just shows it in a different way, such as resting her head on my shoulder, touching her forehead to mine, etc. Because I don’t want to be her voice. I want her to be able to speak for herself. I rattle off acronyms when I’m talking to people about what’s going on: IEP, PDD-NOS, ASD, NT, PECS, MTHFR, IFSP, DD, EI, GF/CF, ABA, the list goes on and on. It’s just part of our everyday language. Therapy is a loaded topic nowadays within the autism community. You’re either primarily an ABA family, or a Floor-Time/Play Therapy family. We’re the latter. I have nothing against ABA, I just think different methods work better for different children. Either way you go, it involves about 40 hours a week. With ABA, professional therapists are doing the work with the child, and with floor-time it’s the parents working round the clock on new and existing techniques. There is an increased level of awareness for disabilities of all kinds, and a vulnerability that comes along with that. “Those things” don’t happen to “other people,” they can happen to us– any of us– at any given time. Lila stopped hitting the typical milestones a long time ago. We live our life at her pace, and nothing (I mean nothing) is taken for granted. We are truly grateful for each and every accomplishment, no matter how small it may seem. We no longer sweat the small stuff– there’s no time for that! We live day-to-day, and have honestly become all-around better people because of our daughter. If I could only choose one child in all the world, I would choose her, every single time. She has been (and no doubt will continue to be) one of my greatest teachers. 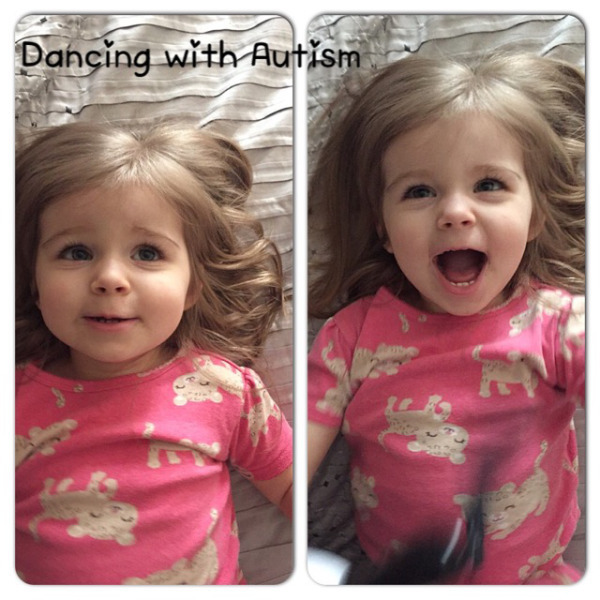 This post originally appeared on Dancing With Autism. Check out their Facebook page for more info. Melinda Brown is a wife and mother from Oklahoma City. She loves to dance, scuba dive and travel – and used to do so frequently back when she had free time. She works full-time during the day and does her best to be the best therapist-parent she can be in the evening. She can be reached through her website: www.dancingwithautism.com.